Academics work in a highly complex world where they must build integrative capabilities and outcomes as teachers, researchers and leaders. As they progress from novice to expert their evolving identities, methodologies and strategies need to be well-attuned to their own strengths and the sectoral expectations: a process that is greatly facilitated by the guidance of leaders and specialist developers. Developing Academics offers guidance to developers, senior leaders and academics on the principles and practices that support high-performing and adaptive academic communities. As the first work to explore the complex nature of academic capacity building, it offers comprehensive development principles, learning theories and specific strategies to support academic growth and development. What makes a high-performing, well-rounded academic? How can our academics be equipped to meet the demands of their current and future roles? What are the essential characteristics of an outstanding developer and development service? How can leaders support and guide high-performing academics who wish to excel? This book is divided into five parts. The first explores academic capacity building and the role developers, leaders and academics play. The second part offers comprehensive guidance to higher education developers, providing the theoretical grounding, methodologies and advanced professional techniques that support their service delivery. The third explores the academic development context, mapping the key capabilities that academics need to acquire as they progress from early career to senior roles across their various portfolios. The fourth explores strategies to evaluate and research the impact of higher education development on learners and their performance. In the final part, the design of higher education services and their interaction with university leaders is explored, illustrating the critical importance of building influence and impact across the university community. The positioning of higher education development as a discipline is also mapped. Developers, leaders and academics will find this handbook to be an essential resource for regular reference: full of useful insights, tips and strategies to help them increase their outcomes and impact. Readers are challenged to reflect on their own leadership and effectiveness throughout this work, as individuals and contributors to academic capacity building. 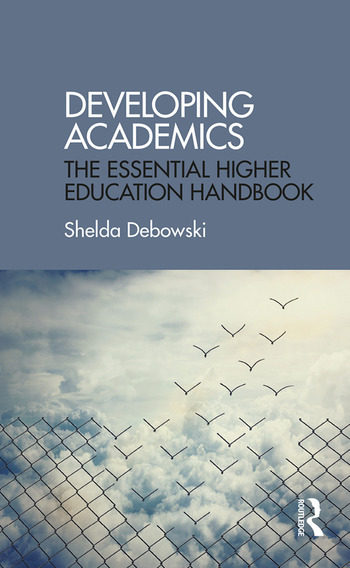 Shelda Debowski holds a PhD in organizational learning and a Masters in education. She has an extensive background in higher education development and leadership.